Winnie jumped out of bed, happy and excited. "Today's my birthday! Today's my birthday! Hoorah!" Her cat, Patches, rubbed himself on her legs. "Oh, hello, Patches. It's your birthday today too! Should we bake a cake?" Patches purred and licked his legs. He ran into the kitchen and hopped on the counter. "I think that's a yes. All right. We'll make a cake for me and a cake for you and we'll do it before breakfast." Patches growled. He wanted breakfast first. "Oh all right. Breakfast first." Winnie fed Patches a can of salmon and then she had scrambled eggs, toast and orange juice. "There now. We're all fed." She found a large bowl, wooden spoon and got out all the ingredients needed to make two cakes. She stirred and swirled and when she was finished mixing, she gave the spoon to Patches to lick clean. "There you go, Patches. Enjoy." Winnie poured the batter into her cake pan. When it was filled up, she noticed there wasn't much cake batter left for Patches' cake. "Patches, you'll have to have a small cake." Patches scowled, ran off and went to sleep behind the bed. The cake baked. Winnie checked on her cake. After it finished baking, she took it out of the oven and let it cool. She put Patches' cake in. Since it was so small, it didn't take very long to bake or cool. She spread icing on top of both and put a candle in each. "Patches! Come and get your cake." Patches ran into the kitchen. Winnie walked around with a huge cake in her hands. "It's my birthday! It's my birthday! Hoorah! Hoorah!" Sitting on the floor was a tiny cupcake. 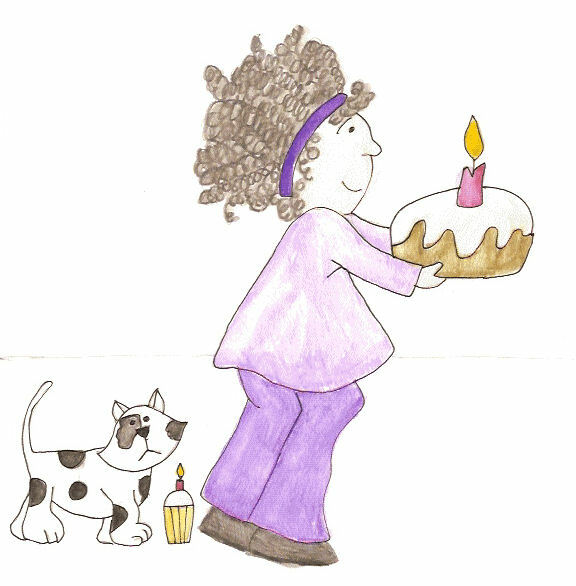 Patches sniffed it, glanced at Winnie's cake and then turned up his nose. Winnie ate the entire cake, including every drop of icing. She saw the Patches wasn't eating his. "Patches, if you don't eat that, I will." The cat ran over and gobbled it down. It might be small, but it's all the birthday cake he was going to get. Later that day Winnie left and went somewhere in her car. Patches sat at the window watching for her. She came back later and gave Patches a present. "Happy Birthday Patches!" Patches tugged at the ribbon and pulled it off. He tore the wrapping paper with his claws and left it in a pile. When he managed to open the box, inside was a huge cake, just for him. "Happy Birthday!" Patches purred and licked all the icing from his cake. He lay on the bed and fell asleep, content and happy that he had a big birthday cake just like Winnie's.